Welcome to the web supplement accompanying the manuscript: "Phylogenetic Portrait of the S. cerevisiae Functional Genome ". Here, you will find searchable interfaces, supplemental figures, and downloadable data, figures, and methods.. Supplementary Figure 1. 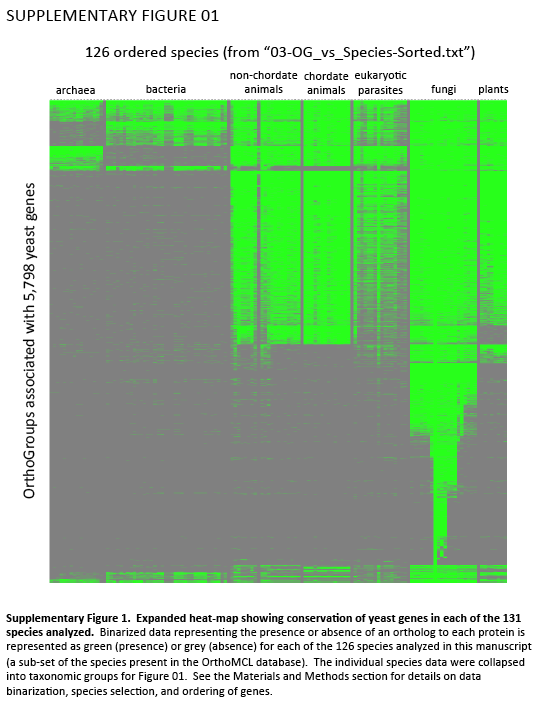 Expanded heat-map showing conservation of yeast genes in each of the 131 species analyzed. Binarized data representing the presence or absence of an ortholog to each protein is represented as green (presence) or grey (absence) for each of the 126 species analyzed in this manuscript (a sub-set of the species present in the OrthoMCL database). The individual species data were collapsed into taxonomic groups for Figure 01. See the Materials and Methods section for details on data binarization, species selection, and ordering of genes. Supplementary Figure 2. Fine-scale analysis of Minor Phylogroups. Expanded view of the Minor Phylogroups with included labels for rough phylogenetic categories to the right. 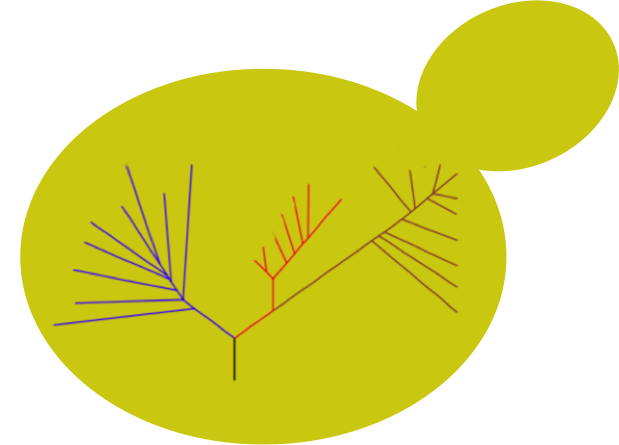 An asterisk (*) indicates that only one gene is present with the identified phylogenetic pattern, and due to space limitations is not fully described in the phylogenetic categories to the right. Supplementary Figure 3. 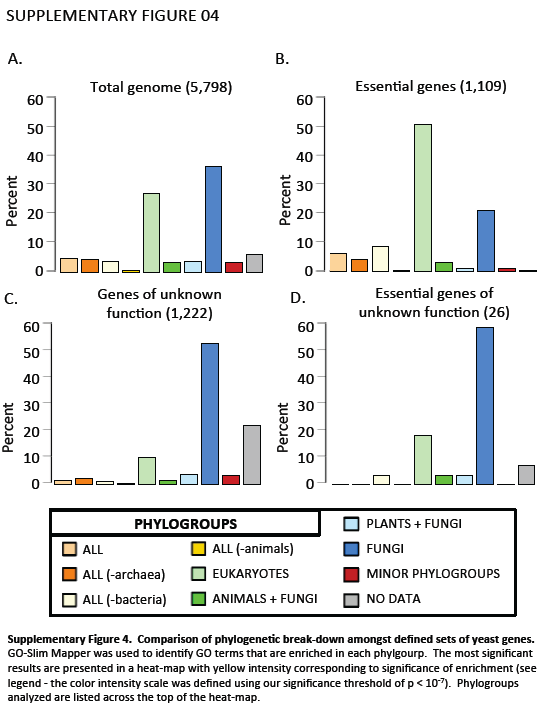 Phylogroup-based analysis of non-annotated/non-deleted genes in S. cerevisiae. Phylogroup-based analysis of the 325 genes that have no data in Saccharomyces Genome Database (SGD) for deletion-based phenotypes. These genes fall into two categories: a) genes that have no reported deletion made, and b) genes that are present in the non-essential updated version of the haploid deletion collection from OpenBiosystems, but no primary literature has been published listing them as non-essential (and therefore these cannot be curated as non-essential). Inclusion of this gene set into this manuscript now constitutes publication of their phenotype, and thus basis for curation into SGD. Supplementary Figure 4. 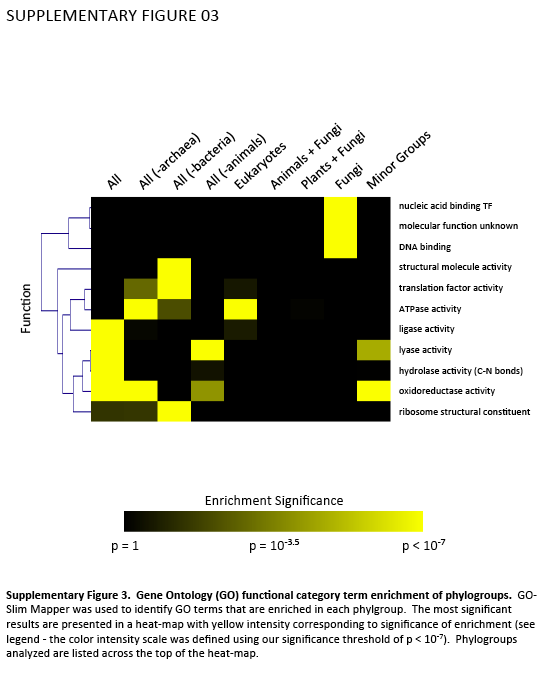 Gene Ontology (GO) functional category term enrichment of phylogroups. GO-Slim Mapper was used to identify GO terms that are enriched in each phylgroup. The most significant results are presented in a heat-map with yellow intensity corresponding to significance of enrichment (see legend - the color intensity scale was defined using our significance threshold of p < 10-7). 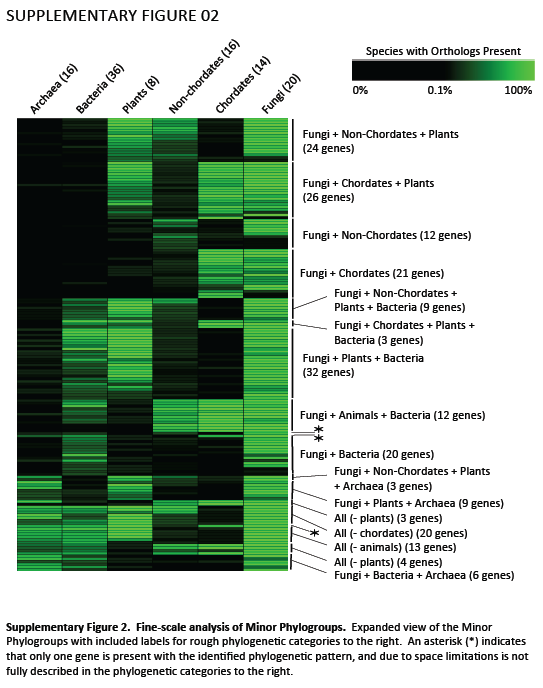 Phylogroups analyzed are listed across the top of the heat-map. Supplementary Figure 5. Alternative clustering approaches result in similar clusters of genes. 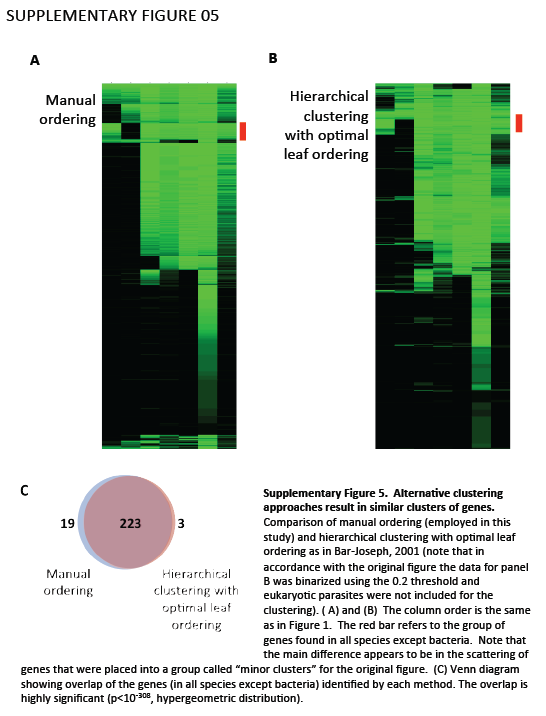 Comparison of manual ordering (employed in this study) and hierarchical clustering with optimal leaf ordering as in Bar-Joseph, 2001 (note that in accordance with the original figure the data for panel B was binarized using the 0.2 threshold and eukaryotic parasites were not included for the clustering). (A) and (B) The column order is the same as in Figure 1. The red bar refers to the group of genes found in all species except bacteria. Note that the main difference appears to be in the scattering of genes that were placed into a group called "minor clusters" for the original figure. (C) Venn diagram showing overlap of the genes (in all species except bacteria) identified by each method. The overlap is highly significant (p<10-308, hypergeometric distribution). Search with a locus systematic ID (i.e YFL037W) or standard name (i.e. TUB2) to retrieve/display its position within the phylogroup map, its annotation, its conservation scores, its computed phylogroup, and that group's Gene Ontology statistics. Please note that the data used in this analysis were downloaded in July 2011 from SGD and OrthoMCL and will not be updated. Toggle the buttons above to show/hide a phylogroup's GO statistics.